When Bryce Miller suggested the Des Moines Register, the largest newspaper in the state of Iowa, chronicle wrestling’s fight to remain an Olympic sport this past February, it wasn’t that the newspaper columnist was trying to promote wrestling and make friends in the wrestling community. He knew the International Olympic Committee’s announcement that the sport would no longer be considered a core sport in the Games after 2016 didn’t make sense. He also simply knew a good story when he saw one when the Register made a seven-month commitment to create “Wrestling’s Olympic Fight” which provides its readers a special feature posted each week until the final IOC vote in September. “We don’t want to give the impression with this project that we are advocating for wrestling. I think people assume that because of the level of investment and amount of coverage,” said Miller, who is in his first year as a columnist after serving as the Register’s sports editor since 2003. Miller has covered the last three Olympics and also became the first American to interview new FILA president Nenad Lalovic this past spring. Along with wrestling beat writer Andy Hamilton, the duo has done a great job covering the sport when the national wrestling community came to town in March, and now through the special weekly feature. And for his efforts, Miller has been named WIN’s 2013 Journalist of the Year. Growing up in Iowa, Miller never wrestled but quickly got a close-up look at the sport when he earned his journalism degree at the University of Iowa 1991 when Dan Gable and the Iowa Hawkeyes were dominating college wrestling. “I’ve always felt like people care about wrestling and the ones who don’t, there is a good chance they have not been exposed to what is most interesting about it,” said Miller. “I’ve always felt it was worth covering. “Compared to over-exposed sports like football and basketball, the main-stream sports, I think there are richer storylines in wrestling. It’s kind of a goldmine for a journalist. I could always walk into a wrestling room and get an interesting story and half the time it was about the athlete and not the sport. Miller also knows that he is a journalist in a state where wrestling is a way of life. “It’s a no-brainer that wrestling is huge in Iowa and I think we’ve gotten an enforcement of that idea the last couple years, especially with the NCAA selling out every ticket and every session in 14 minutes (for the 2013 Nationals in Des Moines). That’s pretty incredible. That’s almost like a (music) concert (selling out). “Then think about the Iowa high school wrestling tournament and how many years in a row they’ve sold out the Saturday championships. “And when ESPN came in (for the NCAAs), they provided more television coverage of the tournament than there has been before. They made those decisions not to become an advocate for the sport, but that they see value and want to invest in it. Is it possible for a journalist to develop a passion for a subject and remain objective? “There is that potential because of my experiences,” Miller said. “Part of my passion for wrestling comes because I think the sport is fascinating and interesting. “With the storylines, there is great accessibility. I can’t even think about how many times I’ve spoken to Jordan Burroughs. He is without a doubt the face of the sport in terms of his level and success. “If the Dream Team is playing basketball in the Olympics, could I get LeBron James on the phone? It’s a whole different sphere and I realize that, but there is accessibility to the sport (of wrestling) where they are happy to have you approach it and write about it. Miller knows he is part of a large group of Register journalists who have excelled in the newspaper’s coverage of wrestling. Another one of those is Hamilton, who was named WIN’s Journalist of the Year in 2011. Miller believes his role with the newspaper allows him to take a different role with the Register’s coverage. “In a columnist role, I can bring some opinion to it more than a reporter,” said Miller, who was also interviewed by National Public Radio this past spring on wrestling’s fight to remain an Olympic sport. “How many mainstream media groups would make the decision to vote wrestling out of the Olympics its front page 1A story centerpiece? I wrote an opinion that it was a bad idea and argued all the opinions that people have argued since. 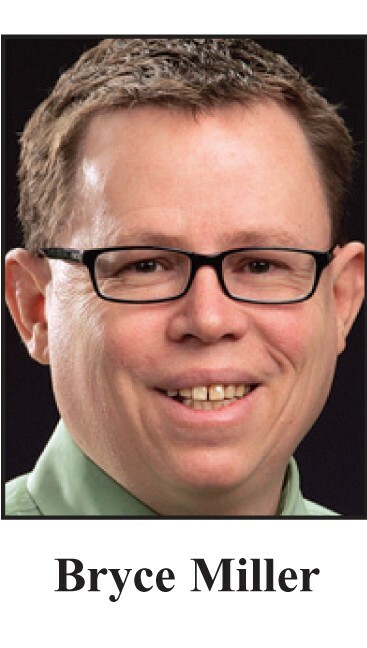 Miller added that the Register has been state-of-art in its coverage of wrestling, including creating blogs and video interviews on the paper’s website — DesMoinesRegister.com — and has tried to maintain high journalist standards at a time that anyone can post an on-line opinion.